The Brilliant Support Activities series contains reproducible activities for use with slower learners or pupils with various learning difficulties operating at the lower levels of understanding at Key Stage 1 and Key Stage 2. The activities in the books follow the areas of science outlined in the Programmes of Study of the 2014 Science National Curriculum for years 1-3 and selected topics of years 4 and 5. The books introduce one concept per sheet, using simple language and clear, black line illustrations making them easy to read and understand. 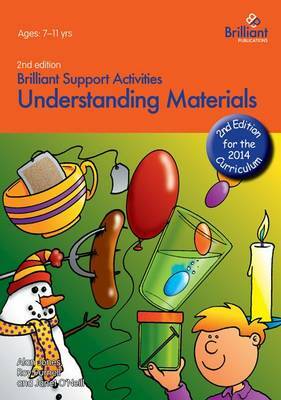 Understanding Materials contains 46 reproducible sheets to help pupils understand some aspects of 'Everyday Materials'. The activities included in the book will help to develop the essential scientific enquiry skills as outlined in the National Curriculum (Working Scientifically), namely those of Observation, Predicting, Recording and Drawing Conclusions. The worksheets focus on grouping and classifying materials, changing materials, and separating mixtures of materials. Other concepts such as forces, heat and magnetism are included within the context of understanding the properties of materials.